By Tessa Fleming | March 8, 2011. Some older residents of The Liberties will remember stories of the Royal visit to Dublin in 1911. Locals prepared for the visit of King George and Queen Mary by decorating the streets with flags and other colourful decorations. Dublin Castle provided accommodation for the Royals. The King and Queen received a warm welcome from the poorer district of the city. It was one of the most spontaneous and heartfelt in all of Dublin. 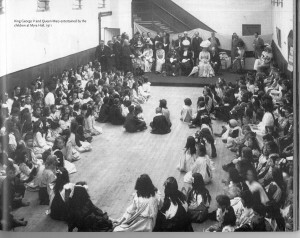 On the first day the King and Queen went to the “Iveagh Play Centre” on Francis Street. The play centre was established by the Guinness Trust. The Ladies Committee prepared free breakfasts on Sunday’s for the poor children of the parish. Children were taught physical education, basket weaving, lace making, singing and dancing. King George and Queen Mary acknowledged the warm and friendly welcome from the massive crowd. Children from surrounding schools were selected to sing and dance for them. Four barefoot girls, Lillie Lawlor, May Lawlor, Bridget King and Annie Boyle made a presentation of bouquets the royal contingent. Both the King and Queen enjoyed the performance clapping to the entertainment the young children provided with their songs and dance. As the carriage pulled off, one woman was almost killed in her rush and desire to get to the carriage to see the Royal couple. She fell beneath the horse’s feet but a nearby constable grasped her and pulled her from the danger. After the visit King George donated £1000 to the poor people in the area, which included the centre itself. Lord Iveagh, (Edward Guinness), presented the King with £50,000 to distribute to the Dublin Hospitals as he saw fit. Within two years the Iveagh centre recorded 4,000 children coming through its doors. It was a community building and part of daily life in the Liberties. In 1915, the Iveagh play-centre closed and on its last night, 918 people attended. The centre moved to Bull Alley, one of the oldest streets in the Liberties. Queen Mary paid a visit to the Coombe Hospital. The route to Hospital through Christchurch Place and Thomas Street allowed the Queen to see poor working class people who struggled to raise families in their small tenant rooms and houses. Her visit to the Coombe Hospital was more than a ceremonial call. She spoke to the patients with humanity and care, listening to the weights of all the newly born babies showing graceful and genuine interest. The Queen asked if she could visit the new Pembroke wing of the Hospital opened just days previously, but the Matron disagreed with her wish as no carpet had been laid or decoration been hung. Her Majesty laughed and hitched up her skirts and tripped across the courtyard to the new wing. On the 12th of July, the King and Queen departed Dublin. Among the many the many places they visited in Dublin, the Kings desire to spend time in the Liberties prompted “The Irish Times to pronounce that “in King George the Dublin poor have a warm friend””. References and pictures Liam O’Meara’s book “The Bayno” and the National Library.